RJB Mining reduced the number of pay grades from 20 to 5, in January 1997. Free shares in the new company, £414 p.w. wages, Holiday bonus £250 increased to £375. It did not affect the attendance bonus of £220. The 1996 / 1997 winter was relatively mild, again not good news for the local mines as markets became harder to achieve and another large mine was to close. However the reason for the closure of Bilsthorpe was exhaustion of economic reserves. On 27th March 1997 Bilsthorpe colliery, (North Nottinghamshire), sunk in 1925-1928 by the Stanton Ironworks Co, was closed after 70 years. Shaft positions: SK 66SE, No1 465251, 361332, No2 465243,361393, 245 feet (74.5m) above sea level. Shaft sinking began 2/7/1925. No1 shaft reached Top Hard on 20/10/1927 at 507 yards and finished 523 yards (478m) to sump. 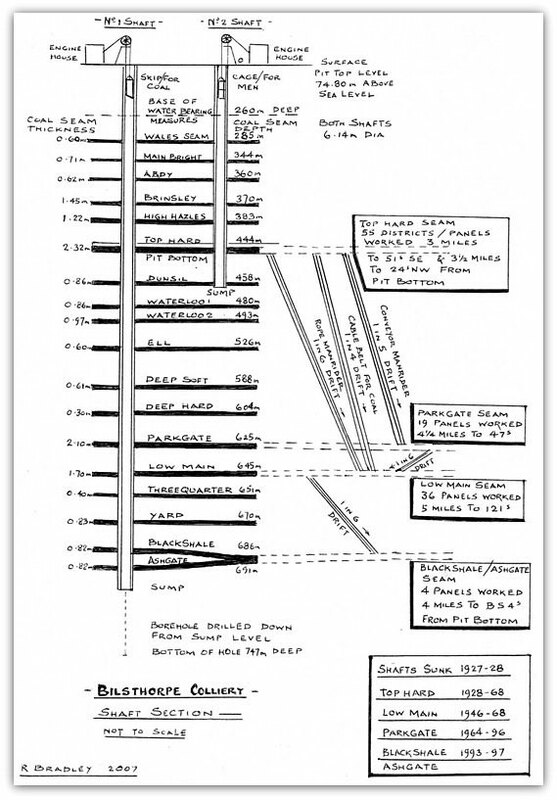 No2 shaft sunk 485 yards (443.5m) to Top Hard on 16/9/1927 and 504 yards (461m) deep to sump at Dunsil seam horizon and completed sinking by 20th October 1927. Both shafts were 20 ft 2in (6.15m) diameter. At No1 shaft a borehole was drilled a further 25 yards (23m) deeper. Sinking at No1 shaft re-commenced 1/6/1928 and finished at 792 yards (724.2m) on 29/10/1928. Spillage in the shaft eventually amounted to 90 yards (82m) below Top Hard pit bottom and had stone and concrete fill. 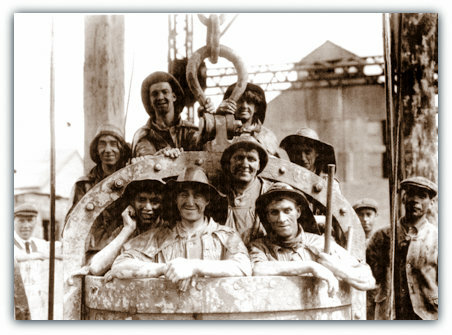 A photo shows the triumphant sinkers in 1928. The brickworks are shown in the photos. It produced good hard bricks very suitable for colliery use at 17s 0d per thousand. 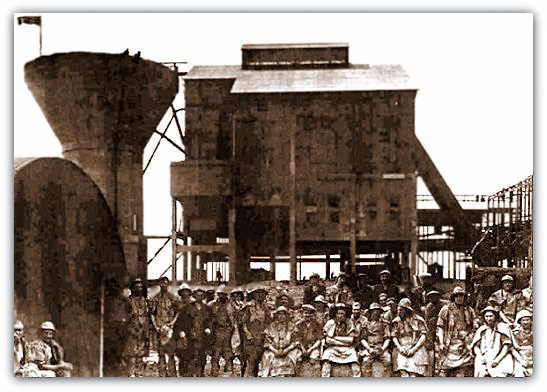 The remarkable low price included all depreciation costs on plant and interest on capital and was largely responsible for the cheapness of the buildings at the colliery. There were two stiff plastic brick making machines complete with recesses and the necessary haulage and tipping arrangements and cost £4,250 and was purchased from Bradley and Crane of Wakefield. The house and roof were built at a cost of £1,456 and the chimney and a kiln with 20 chambers cost £5,300. The brickyard had a capacity for 120,000 bricks per week. A new village was built by the Stanton Ironworks Co adjacent to the old village of Bilsthorpe which lies to the East of the A614 main road from Nottingham to Worksop in order to entice miners to go to an out of way place at the time of sinking. All these new model villages had everything, as mentioned before, but in effect they were open prisons there was no need to go out of the village! Travel was difficult anyway. No one had cars those days and a charabanc / bus only ran once a week. A Welfare hall was built housing a concert hall, games room, lounge bar, small lounge, committee room etc. There was a hall for entertainment able to seat 300 people and could also be used for dancing. A 15 acre sports ground was provided with facilities for football, cricket, hockey, tennis and bowling green. There was a pavilion with changing rooms, showers, toilets and kitchen. A temporary Institute was erected in 1927. A Division of St John Ambulance Association and a women’s’ Nursing Division were formed. The Stanton Arms pub was also able to accommodate boarders. A brickyard adjacent to the colliery site was commenced a few years prior to sinking and therefore there was a large supply of bricks available for buildings and shaft construction. To accommodate the sinkers 60 ordinary bungalows were built as well as 9 communal ones for single men. Sinking began at No1 shaft 2nd July 1925 and there was 298 yards (273m) of water-bearing strata, the Top Hard seam at 483? yards (442m) and completed at 485 yards on 16th August 1927, thereafter the sinking was continued later down to what was considered to be the bottom of the workable seams at 792 yards (724m) by 29th October 1928. There was an inset at High Hazles horizon at 1256’ 0” (383m). Concrete was used from the onset and for the first 60 feet in the dry sandstone the concrete lining was 4 inches thick. 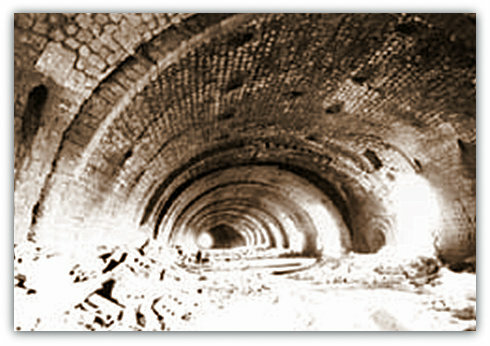 As soon as the water was reached reinforced concrete was used, the strength of the reinforcement increasing with the depth of the shaft. For the first 50 yards it was 14 inches thick, 50 to 100 yards it was 17 inches, 100 to 150 yards it was 20 inches, 150 to 200 yards it was 22 inches and for 200 to 284 yards it was 25 inches thick. The lower measure marked a point 10 feet below the breccia which is a concrete type of strata that prevents the water from the Bunter passing into the coal measures, unless fractured of course. Through the coal measures 14 inches of brickwork was employed (the bricks being made at the brickyard) and was not as expensive as concrete and small insets were made at the more important seam levels. Good washed and screened gravel was obtained from a gravel pit adjacent was used in the quick drying cement at the base of each length. Through the water-bearing measures water was pumped at the rate of 50,000 gallons per hour by pumps rated at 60,000 gallons max against ahead of1,040 feet. Wooden tubbing was placed round the shaft and metal rings were tightened against them by means of wooden wedges between it and the tubbing. The least distance sunk without concreting up was 5 yards and before concreting could start a seating had to be made by driving into the shaft wall and cutting out a wedge which varied in depth from 1 foot 6 inches to 3 feet according to the nature of the strata. The tubbing was driven upwards and the metal rings extracted as required until the whole section was completed. The sinking then continued and after the concrete had set grout was forced under pressure between it and the shaft wall. Sinking was advanced 30 yards at a time before brickwork was done and the brickwork was built up from a concrete ledge similar to the ones made whilst passing through the water-bearing measures. Production started from the Top Hard seam started in 1927/1928. Blandford and Gee of Doncaster used the cementation method of sinking through the water-bearing measures. Master sinker was Fred Travis. Tragically 14 sinkers were killed in a terrible shaft accident when the rising main pipe broke and fell down the No1 shaft onto the sinkers below (see report). The pit bottoms were 20 feet (6m) wide with side walls some 6 feet (1.8m) thick. The headgears were of the lattice type and 80’ 3” (24.5m) high to centre of the 19’ 0” (5.8m) dia pulley wheels. The steam winding engine for No1 shaft was supplied by Markhams of Chesterfield and No2 engine was a second hand one used at Pleasley colliery for deepening the shaft there. 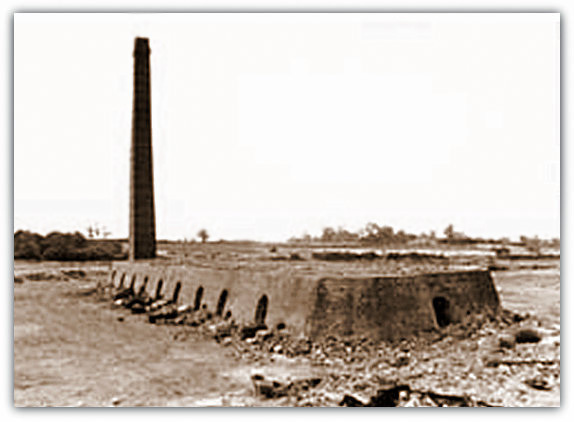 8 Lancashire boilers used to supply the steam and the brick built boiler chimney was 175’ 0” (53m) high. The water supply was pumped from a 9’ 0” (2.74m) dia well some 136’ 0” (41.5m) deep and softened in a Lassen Hjort plant before being used in the boilers or in the village houses. There were brick-built workshops for all trades such as fitters, electricians, smith, joiner and Enginewright’s office, Next was a machine store and general stores were adjacent to the shafts as was the washery plant and screens. This was one long building 330 feet x 39 feet (100m x 12m) at a cost of £8,138. A railway line was extended into the stores building and storage bins situated alongside, cost £164. Fitting shop had a 4 feet dia grindstone (£10), 14” emery wheel (£13 10s 0d, tube and bolt screwing machine (£65), one lathe (£112) and another lathe (£358), radial drilling machine (£154), planing machine (£230), marking off table (£38). Heating throughout was by steam pipes. Electricians shop with benches and the usual tools. Smith’s shop had 4 hearths with forced draught from a fan (£46 15s 0d), drill sharpener (second hand from other colliery), wall crane (£17 10s 0d), surface block (£50), 5cwt Massey hammer (£410). Carpenters shop had a 10hp motor etc (£60), drives shafting for saw bench etc (£52 10s 0d) plus tools. Lamp house 70 yards from shafts, 100 feet 7 ins x 36 feet 4 ins (30.6m x 11m) including mess room, acid store, office and repair room and an oil section then the lamp racks etc, tiled floor, polished tiles for bottom 5 feet (£1.3m) of wall and shelves. There was a cover over to prevent rain getting into the building whilst passing lamps in or out. 150 oil lamps on a rack that cost £20. Ackroyd and Best lamps and all attachments etc, unlocking magnets (£37 10s 0d each), cleaning machine and filler £95 10s 0d and each lamp cost £1 each. The electric lamps were made and supplied by Ceag Ltd of Barnsley on 6 charging stands costing £13 15s 0d each to hold 150 lamps and 10 electric lamp hanging racks and costing £46 each to hold 150 lamps. There are 900 accumulator lamps at 18s 0d each. There are 2 cleaning machines at £24 10s 0d each and 4 unlocking magnets at £10 each. 2 trolleys costing £6 15s 0d each were for moving lamps around. 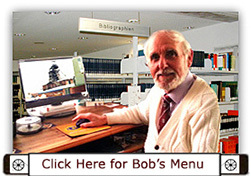 Hailwood and Ackroyd flame lamps and Ceag battery hand lamps in use. The first 9 Ceag cap lamps were introduced in 1933. There was an well equipped ambulance station with hot and cold water laid on and a nurse’s room and large garage adjacent costing £980 containing a Morris Commercial 16hp motor ambulance containing 2 stretcher beds. A nurse was on duty on dayshift. There is a store room for underground boxes that were brought to the surface for replenishment each week. The fan house 22 feet 9 inches (6.93m) long and 21 feet (6.4m) wide and the fan occupying 5 feet 9 inches (1.75m) wide. The motor was by Bellis and Morcom, compound, twin cylinder V type with steam pressure at 130 lbs per sq in and exhausting against 3 to 4 lbs back pressure developing 218 BHP. The speed could be varied from 60 to 180 revs per minute. The engine and fittings etc cost £1,095. The Waddle fan was mounted direct on the shaft of the engine. The fan was 15 feet (4.57m) dia and had a 12 feet (3.66m) inlet and capable of 300,000 cu feet of air per minute against a water gauge of 3 inches at 180 revs per minute. The cost of the fan was £750. The fan drift at 18 feet wide and foundations for the plant cost £3,189 and the house was built of plain bricks with a tiled floor whilst the fan drift was built of reinforced concrete. Another drift was driven for a second fan that was electrically driven. It was arranged that the fan could reverse the air should it be necessary to do so in the event of an incident. The 25 cwt steel coal tubs from the shaft top passed along creepers to the weigh cabin that was 10 feet 6 inches x 12 feet (3.2m x 3.65m) and contained a Pooley automatic weighing machine that was adjusted to read the amount of coal in the tub by meaner of a ‘finger’ which slid along a scale as the tubs ran over the weigh plate. The ‘finger’ was steadied by means of a dashpot filled with light oil or paraffin. If the tubs ran by quickly over the plate the ‘finger’ overshot the true weight by cwt before returning to its correct position. The machine cost £144 and had a platform 3 feet 7 inches x 4 feet 7 inches (1.09m x 0.1m) and was up to 5 ton strength but only graduated on the scale every 28 lbs up to 2 tons. It was stated that if a checkweigh man was not required the men were paid by ‘yardage’. 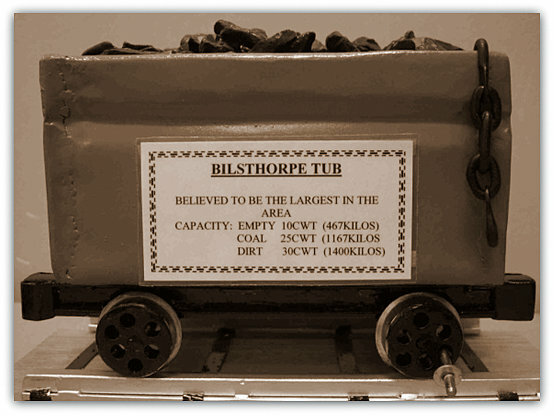 Since the tubs were used in conjunction with conveyors and gate end loaders the average weight of coal was 22 cwts, however it was noted that if the tubs were handfilled they could weigh up to 28 cwts. The gantries, tippler house, tipplers, screens and screen house were contracted to Plowright Bros of Chesterfield at a cost of £28,973. The tubs gravitated from the weigh house to 2 creepers that raised the tubs 31 feet (9.45m) up a 1in6 gradient. All the rails and creepers were set in concrete and covered over by corrugated iron sheets on a steel framework and a space was left for a third creeper to be installed. At the top of the creepers a retarder allowed the tubs to slowly move to the tipplers. The tippler house was 50 feet 6 inches x 73 feet 6 inches (15.4m x 22.4m) and was a steel structure and halfway down each side of the building was a 4 feet (1.2m) pane of glass the full length of the building. The 3 tipplers were automatic and a full tub pushed the empty tub out which triggered a catch that set the tippler in motion again. 2 men handled the tubs which were dealt with at the rate of 3 or 4 per minute. The empties then gravitated to a retarder which then allowed them to run slowly back to the shaft top. The screen house was 129 feet (39.3m) long and 50 feet (15.24m) wide and was situated about 80 yards (73m) from the shafts. It was constructed of steel framework with 4 inch (0.11m) brick panelling. All floors were reinforced concrete and the roof supported by light metal girders. A 6 feet (1.83m) high panel of glass window ran the whole length of the building and the remainder covered by asbestos cement sheets. The grades of coal produced were Hards which were greater than 7 inches (0.18m), Cobbles to 3 inches (0.09m), Trebles 3 to 2 inches (0.09m to 0.06m), Doubles 2 to 1 inches (0.06m to 0.04m), Singles 1 to inch (0.04m to 0.01m) and Slack inch (0.01m) and less. The section of the Top Hard that the screens were designed for consisted under a hard shale roof...Coombe coal 10 inches thick that was inferior and left to form a roof, Brights 2 feet 3 inches (0.69m), a small dirt band, sometimes absent, hard coal 1 foot (0.3m), Bat 2 inches (0.05m) and Brights 1 foot 3 inches (0.38m). The screens were belt driven by Parkinson 85 BHP motor with Ellison switchgear and of the ordinary jigging type with circular holes and divided the coal into 3 sizes...greater than 6 inches (0.15m), 6 inches (0.15m) down to 3 inches (0.09m) and 3 inches (0.09m) down to dust. The coal from the tipplers went to a bunker at the foot of the washery on a 3 feet (0.91m) wide trough belt driven by a Parkinson 20 hp motor with Ellison starter and a similar belt took dirt from the third tippler straight to a bunker in the washery. The other 2 sizes of coal passed onto 2 large picking belts each 4 feet 6 inches (1.37m) wide. There were 4 picking belts in total...No1 was 2 feet 9 inches (0.84m) wide for big London Brights, No2 was the Main belt 4 feet 6 inches (1.37m) wide for coal larger than 6 inches (0.15m), No3 was 2 feet 9 inches (0.84m) wide for Bright Cobbles off the Main belt and No4 was 4 feet 6 inches (1.37m) wide for mixed Cobbles from 3 to 6 inches (0.09m to 0.15m). Above the Main belt was a 2 feet 9 inches (0.84m) wide metal sheet belt which took backwards to another cross belt of the same size any coal with a little dirt in it. This was known as the ‘Collier’s coal’ and was sold cheaply to the men. The cross belt fed another similar belt which loaded directly into a wagon. All 3 belts were driven by separate 20 hp motors. Only dirt and ‘Collier’s coal was taken from the mixed cobbles belt. A 4 feet 6 inches (1.37m) wide metal sheet belt for dirt ran under the floor beneath the picking belts at right angles to them and there were trap doors in the floor and the dirt was shovelled through them onto the dirt belt and away to a bunker in the washery where it joined the washery dirt and that direct from the third tippler. 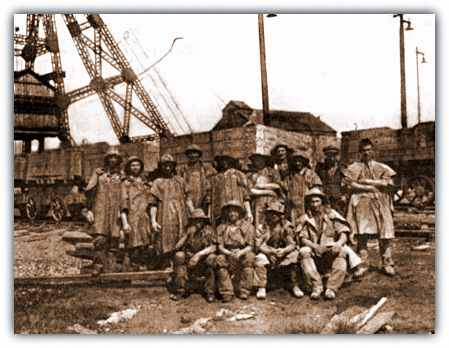 The picking belts had ribs every 5 feet (1.5m) to prevent the coal rolling down the loading jib into a wagon and each picking belt had a loading jib.